Being a fiction writer has a lot of perks. One of those perks is creating characters and giving them traits, looks and the life I want them to have. How fun is that, ay? Fun, but not as easy as you’d think. I typically start by “interviewing” the main characters of the story. I may have an idea of what they do for a living and what their background is, but I try to do this interview process before I’ve thought too much about the character. Doing it early means I’m surprised by some of the things that pop up. This process worked just fine for me until David Hennings, the hero in The Rebel, came along. With David I had a big problem. David, you see, wasn’t meant to be a hero at all. David was supposed to be the jerky brother from The Defender, my second Harlequin Intrigue. While writing The Defender, I realized the heroine had a talent for wrapping her father and middle brother around her finger. I got mean and tossed in a male family member who wouldn’t be played. Enter David, the jerky oldest brother who wound up having one scene in the book. His job was simply to be crabby to his sister in front of the hero. Then he could go away. Easy. Penny remained quiet. And when the hell had Russ ever experienced that phenomenon? “Will someone please tell me what is going on?” David said, his voice sharp enough to chop wood. Russ looked at Penny, who refused to even glance at him. She kept her focus on the phone, but her cheeks had gone hollow and she looked to be chewing on the inside of them. Apparently, she and David didn’t get along. In the thirty seconds Russ had known David Hennings, he despised him. Plus, he didn’t like his attitude regarding Penny. And if her father and Zac weren’t going to deal with that, Russ would. He reached over the desk, picked up the receiver and dropped it back in its cradle. The three occupants in the room went silent. Obviously people didn’t hang up on David. Too bad. Someone had to take control. “He’ll call back,” Russ said. Penny stared up at him, her big blue eyes round and, if his guess was right, amused. Thirty seconds later, David was patched through again. “Did you hang up on me?” he hollered. Boom. Jerky David had done his job and I was able to show the hero taking control of the situation. All while defending the heroine. A win-win. Yay, me! I wrote the scene and sent David on his way, never intending to have to deal with him again. After that, I didn’t give him a whole lot of thought. At least until three days after The Defender released and I received an email from a reader wanting to know when David would get a book of his own. What? She wanted that jerk to have a book? Really? A day or so later another reader emailed me asking the same thing. That made two readers out of thousands. Not a big deal. The next reader email I received had a one word subject line. Guess what the word was. Go ahead, guess. I’ll admit my initial reaction was to start screaming. I mean, seriously? This guy was a total jerk to his sister in the one and only scene I put him in. Who would even like a guy like him? Letters continued to show up. Then one of my writer pals posted something on Facebook about how much she enjoyed The Defender. She went on to say she hoped there would be a book for David. Gah! Leave it to me to completely miss that possibility. Over the next few weeks I thought about David and his relationship with Penny. Could I redeem this guy after all the awful things I made him say about his sister? And could I do it in a way that my readers would connect with? I had to turn jerky David into hero David. I started by going back to my process and interviewing him. I knew he was the oldest sibling in a family of criminal law attorneys. I knew he got along well with Zac (the middle sibling), but not Penny. I knew he lived in Boston. I started my interview with all of these facts and after about thirty minutes, David started to spew. Eeeee-doggies he had some complaints about his sister. And you know what? Some of those complaints were warranted. After completing the interview, I promised David his side of the story would be heard. To do that, I had to make readers understand him and his actions in The Defender. Not only did they have to understand him, they had to accept him. No. Forget that. If he was going to be a hero in a romance novel, he had to be way more than likable. Always one to enjoy a challenge, I went to work. When I finished the book, I sent it off to my editor with my fingers crossed that I’d done my job. I also remember feeling incredibly thankful to the readers who wrote to me asking for David’s story. I learned so much about human nature and sibling rivalry and well, patience, while writing his story. I found myself once again thanking David for being a jerk in The Defender. If he hadn’t been so awful to his sister, I wouldn’t have had the chance to stretch my wings as a writer and redeem him. Readers, has there ever been a character you’ve wanted to see redeemed? USA Today bestselling author Adrienne Giordano writes romantic suspense and mystery. She is a Jersey girl at heart, but now lives in the Midwest with her workaholic husband, sports obsessed son and Buddy the Wheaten Terrorist (Terrier). She is a co-founder of Romance University blog and Lady Jane's Salon-Naperville, a reading series dedicated to romantic fiction. For more information on Adrienne's books, please visit www.AdrienneGiordano.com. 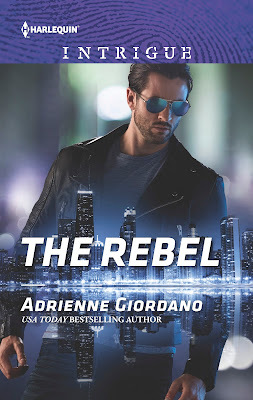 To get the inside scoop on Adrienne’s new releases and VIP reader giveaways click here. For information on Adrienne’s street team, Dangerous Darlings, go to http://www.facebook.com/groups/dangerousdarlings. One of my favorire rebel characters is Kat (played by Julia Stiles) from "10 Things I Hate About You". Good morning, Natalija. Thank you for popping in. I always love a good rebel. They're such fun characters! My mind has gone blank, but I do appreciate a rebel. One rebel I like is Castle & he's funny too! I love Castle! He's one of the characters you want to roll your eyes at but he's so darned funny you can't. LOL. Loved this post! Especially since I had the same issue redeeming a very bad boy in one of my books! I think my editor choked when I told her he was the hero of his own story! Haha. She didn't see how it was possible. Hopefully, I did as good a job as you did redeeming David. Congrats! Love, love, love your cover too! Saxy! Hello, my friend! Thanks for popping over. You always do an awesome job on your books! Dee J. Adams, gang, check her out. You'll love her! Hmmm, a fav rebel... nothing has popped into my head, but I know there are plenty of characters out there that I have enjoyed... Congrats on this latest release!